A forum on public health drew only four of the 10 people now in the race for mayor. Those who did come put unique spins on similar ideas. 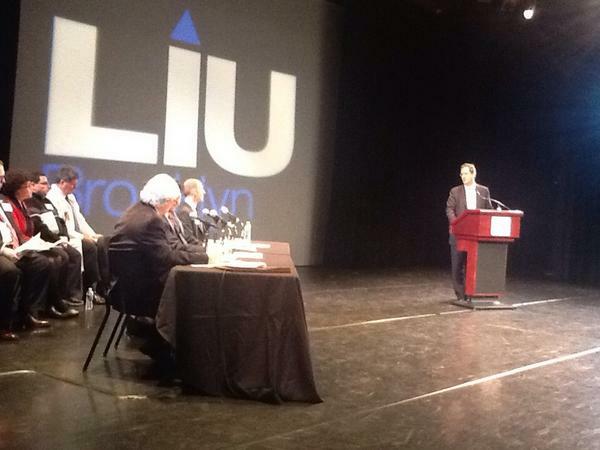 A crowd of about 250 assembled in Long Island University’s Kumble Theater on Wednesday night to hear four of ten invited candidates answer a panel’s questions on issues of public health that will face the next mayor. In attendance were Republican Tom Allon, CEO of Manhattan Media, and former Councilman Sal Albanese, Comptroller John Liu and former Comptroller William Thompson. Not in attendance were Adolfo Carrion, John Catsimatidis, Bill de Blasio, George McDonald and Malcolm Smith, and the two candidates—Joe Lhota, and Christine Quinn—who are considered front runners in the race; a recent Quinnipiac University polls found Quinn leading Democrats with 35 percent support, and Lhota ahead of other Republicans with 23 percent. But 53 percent of voters are still undecided. The questions focused largely on the access to healthcare for low-income and minority communities, but also addressed fears that healthcare is becoming increasingly privatized. The closing of hospitals, the effect of superstorm Sandy on the healthcare system, and healthcare education were also addressed in the panelists’ questions—as were some of the mental health issues raised by two recent subway deaths and the Sandy Hook massacre. Many of the same ideas recurred in the candidates’ answers, who all agreed that community-based organizations were central components of the healthcare system and could be useful in trying to effectively reallocate funds—city and federal—to make sure that underserved populations get more services. But subtle differences did emerge between candidates as to how exactly that would be achieved. For Allon, at stake is the question of accountability. “Community centers are the lynchpin of my healthcare system,” he said, “but until separate elements of public health start working together with better oversight, the system will be plagued by problems unsolved by a piecemeal approach.” For this reason, Allon recommends creating more frontline services to alleviate emergency room congestion resulting from recent hospital closures. Allon wants to see collaboration between the public and the private sector, and with the right oversight, believes that a lot of the resources that are currently available will be freed up. He stressed mental healthcare and the importance of utilizing schools to provide better services, both by targeting students for health education, but also by utilizing the school buildings—which are only being utilized from eight to three—for other community needs; he used this as an example of how thinking like a businessman can be useful in responding to the needs of underserved populations. Sal Albanese considered it “malpractice” to ignore the needs or the contributions of at-risk communities by reacting to, instead of preparing for crises. He is “committed to funding community organizations as a priority,” he said. Board members from labor and from community organizations have valuable input, said Albanese, who also believes that government should reflect diversity of the city. “There is enough qualified staff from each ethnic background for us to hire a diverse staff. People feel more comfortable when they see people who look like them, especially in hospitals settings.” He also stressed the importance of schools and education for making use of a captive audience to deeply ingrain healthy habits. William Thompson stressed the need to keep services in the communities they serve. “Bloomberg has moved healthcare out of the communities that need it,” he said. “No one wants to travel to get healthcare.” He would seek to emulate what he called the Cincinnati model, which brings healthcare to schools, for example, testing for childhood diabetes in addition to eye exams. “It’s a question of making it a priority of matching dollars to needs,” Thompson said in response to a question about disparities in health funding across neighborhoods. “Every labor contract in the city of New York will have expired at the end of the year,” he said in response to a question about fiscal cuts. “But no money has been put aside for settlements. If we’re going to make reductions, we need to include vulnerable populations in the conversation.” He applauds Mayor Bloomberg for his “top-down” health initiatives, but says many populations have been ignored, such as the HIV population. John Liu was “not optimistic that city can make up federal shortfalls,” but added, “community based organizations are very cost effective.” As comptroller, he said, he has sought to reduce amount of bureaucracy that organizations have to deal with in order to free up CBOs. Furthermore, for Liu, “labor unions are very important.” He stressed the point that public health should in no way be privatized, and that strong healthcare is an economic boon with a strong return on the investment. “We have an administration that wants to give a hard time to the unions,” Liu said, claiming in addition that the way an administration deals with the most vulnerable is not a question of dollars but a question of attitude. “Any one in this room could become disabled tomorrow,” Liu said. With today’s technology, it is only a question of attitude that keeps the disabled or the vulnerable from getting the care they need. Jackie Vimo, director of advocacy for the New York Immigration Coalition and Judy Wessler of the Commission on the Public’s Health System spoke during a break about the dangers facing public health in New York City. Written by Nick Powell on January 17, 2013. Posted in Blog, Budget/Taxes, Campaigns/Elections, Daily, Features, Health Care, Heard Around Town, Latest, News. 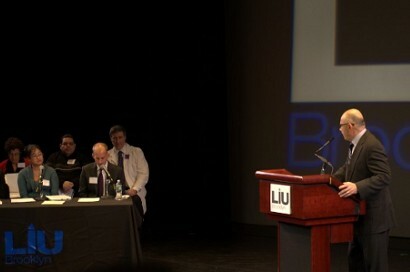 At a forum last night at Long Island University in Brooklyn, several New York City mayoral candidates articulated their platform on public health and answered questions from a panel on various aspects of the issue, although one went off script when asked about Mayor Michael Bloomberg’s record in the area. The candidates included former City Comptroller Bill Thompson, City Comptroller John Liu, former City Councilman Sal Albanese and Manhattan Media publisher Tom Allon [Manhattan Media is the parent company of City & State.] Thompson, who opposed Bloomberg in the mayoral race in 2009, was asked to give a grade on the mayor’s public health initiatives, and though he commended the mayor on instituting the smoking ban and helping eliminate trans fats, overall he felt his record was mixed, beginning with the ban on sodas over 16 ounces. NEW YORK — Public health under Mayor Michael Bloomberg has largely come to be equated with smoking and trans-fat bans, calorie counts on menus and a limit on the sale of large, sugary drinks. Candidates who hope to succeed Bloomberg, however, will be challenged with helping to rehabilitate public hospitals following Superstorm Sandy, a looming $3 billion city budget gap the could curtail spending and questions over what federal health care reform will mean for the city. At a forum on public health on Wednesday, four mayoral hopefuls spoke about what they see as the critical needs of the public health system, agreeing that too many of the neediest New Yorkers remain without proper health care. Democrats John Liu, William Thompson and Sal Albanese, as well as Republican Tom Allon each took turns on the stage at Long Island University in Brooklyn. The two expected frontrunners for the party nominations for mayor, Democrat Christine Quinn and Republican Joe Lhota, did not attend. Liu, the city’s comptroller, said he wasn’t optimistic that the city could make up for a reduction in federal dollars caused by the Affordable Care Act. “There’s a big question mark around Obamacare,” he said. There is money to be found in the system to pay for improvements, but it might well take more audits to find it, he said. Liu pointed to numerous cases of health care fraud over the past few years which found the misappropriation of hundreds of millions of dollars. Attacking corruption was something of a refrain for each candidate. Tom Allon, the sole Republican candidate to speak at the forum and owner of Manhattan Media, referred to Pedro Espada Jr, a former state senator who was convicted of looting hundreds of thousands of dollars from the Bronx health care network he founded. “That kind of stealing is probably still going on elsewhere in the city,” added Allon. Fixing the city’s hospitals is “a question of management,” he said. That means being “smarter about where our dollars are coming from,” said former New York City Comptroller Bill Thompson, who held the office from 2002 until 2010. Thompson, who previously ran for mayor in 2009 but lost to Mayor Michael Bloomberg by about 4.5 percentage points, took aim at his former rival by saying the problem of finding money in the budget was exacerbated by unresolved labor disputes with city employees. Calling it “irresponsible” not to have set aside funding to cover those projected expenses, and with the budget hole fix still unclear, paying for better public health would be an immense challenge, Thompson said. Still, public health remains a priority. “There are ways of saving money without sacrificing care,” he said, noting that the hospital’s network system needed to be revised to create a more efficient model. He said that as comptroller, he took the “unusual” step of looking into waste in the public health system. While the short-term fixes were unclear, the candidates pointed to a common long-term solution: a preventative approach to addressing illnesses. By better educating children and by identifying early warning signs of disease, candidate Sal Albanese, a former Councilman who held office until 1997, suggested the city could save money going forward. “We need pediatric wellness clinics” for those who cannot afford a doctor’s visit, as well as “nurses who can go into a person’s home” to help care for newly-born children as young as three months, he said. Albanese, who previously worked as a health education teacher in the New York City school system, said he received his masters degree in health education free of charge, courtesy of the state of New York in the 1970s, when the state needed to encourage more qualified educators in the field. This kind of future planning should be continued, he said. A model for the integration of health services in a school system, added Thompson, could be Cincinnati, which incorporates medical education and check-ups. This, he says, helps catch mental illnesses and diseases like diabetes, which may go undetected by parents. While candidates mostly lauded Mayor Michael Bloomberg’s record on public health, Thompson tried to take the fizz out of the soda ban, saying it was “good P.R., but a missed opportunity to do more for public health.” That would include addressing the unequal distribution of parks and recreation areas available to the neediest. Further, nearly all the candidates agreed the mayor erred in moving away from community-based organizations to address health care needs. Having CBOs could eliminate cultural in-sensitivities and other onerous burdens that would be placed on the patient. By consolidating in the hopes of saving money, said Thompson, Bloomberg’s policy left many underserved communities behind. “Health services should be closer to a community,” he said to applause. CBOs would mean easing language restrictions, which Liu said can result in the death of patients. “I have constituents come to me and say a loved one died because they couldn’t explain their health problem,” he said. Liu said he fought for equal language access as a councilman. Sponsored by 22 organizations, ranging from the Commission on the Public’s Health System to New York Immigration Coalition and the New Yorkers for Accessible Health Coverage, the forum offered a handbook to the attendees and candidates that highlighted key public health issues facing the city. “The answers to all your questions are probably in this book,” Liu joked. Jackie Vimo, a representative of the New York Immigration Coalition and forum member, called the book a “to-do” list for the next mayor of the city. Those needs include identifying focusing on immigrant access, chronic conditions, and helping individuals with disabilities. The group further highlighted social determinants that factor into health, such as poverty, nutrition, lack of exercise, and low paying, potentially dangerous jobs that can pose a challenge to finding the time to see a doctor, she said. According to the Immigration Coalition, almost 2.5 million residents are designated as “medically underserved,” further underscoring the challenge to serving them. Hospitals that serve many Medicaid patients do not see enough revenue to remain open without public assistance, she said, but that assistance, which comes from the state, is often misused. The next mayor needs to help address this, she added. Hurricane Sandy further exposed the consequences of limited hospital options in cases of emergency when a handful of hospitals were forced to evacaute. Maimonides Hospital took on about 100 more patients as a result of Coney Island Hospital’s closure. New York University’s failed generators forced the evacuation of hundreds of patients the night of the storm, with some 200 patients transported to five hospitals throughout the city. In addition, the Bellevue Hospital Center emergency room and the VA New York Harbor Healthcare system remained closed for weeks after the storm. It was a small turnout this Wednesday at the New York City Mayoral Candidate Forum on Public Health, hosted by Long Island University of Brooklyn. Nonetheless, a few major themes emerged from those four candidates that were able to attend. Mayoral Candidate William Thompson brought up the Cincinnati community school model, where basic health services such as BMI screenings, testing for diabetes, and mental health counseling are provided at public schools. The model sits on the notion that schools should serve as centers for health-promotion and prevention. Candidate Thompson would like to see this model brought to NYC, as well as expanded to include programs for physical activity and specialized services by trained health professionals. Candidate Tom Allon hinted on the Cincinnati school model through his mention of city joint-use agreements, which allow shared use of public property. The past ten years show that NYC has opened up to the idea of joint-use agreements, as can be seen by the PlaNYC Schoolyards to Playgrounds Initiative. However, this year’s mayoral candidates feel that schools themselves remain an untapped potential when it comes to city joint-use policy. Candidate Allon sees potential behind utilizing schools during evenings and weekends for public health services for all ages. All candidates agree that Mayor Bloomberg’s public health policies, including the Soda Ban, have not done enough to dig into the communities and reduce health disparities. Mayoral Candidate Sal Albanese highlighted the importance behind community-based organizations, noting that they must be included in the city budget and decision-making . Candidate John Liu suggested ridding CBOs of stress from city funding by reducing paperwork and allowing them to do their job. While the ideas mentioned may seem repetitive, their collective presence at the Mayoral Candidate Forum on Public Health symbolizes NYC’s ongoing efforts to conjure cost-effective and creative approaches to tackling public health issues at the municipal level. How we approach “food policy” depends on the next mayor’s approach to public health as a whole.